Click on image to view complete newsletter. Click on image below to view complete newsletter. THANKS: Philippians 1:3-5 I thank my God every time I remember you. In all my prayers for all of you, I always pray with joy because of your partnership in the gospel from the first day until now. Before making our appeal for funds, I must start by saying "Thank You" Yesterday was Jacky and my 4th wedding anniversary! And with us in "full time ministry" mode right after the honeymoon, it means for the last 4 years, you have supported our family and our ministry in Indonesia (with some outreach in Jacky's native Philippines) I truly praise God for each of you who have helped us financially and/or encouraged us and/or prayed for us in our life work. Sorry: Acts 24:16 So I strive always to keep my conscience clear before God and man. Now I must apologize for much. I am sorry for sending out this email when I have said at least once that I would not send any more "appeal for funds" emails and truly pray for the day when these emails are extremely rare or stopped. I am sorry for not sending out more personal "thank you"s when they were appropriate. Most of all, I am sorry for doing a horrendous job as of late sending out regular newsletters and updates, shooting myself in the foot when it comes to fundraising and even worse not properly encouraging and interacting with those God has already called to be interested in our lives and ministry. Please forgive me as Jacky and I work together to find solutions going forward. Financial Update: Philippians 4:18a I have received full payment and even more; I am amply supplied After receiving between $25,000 and $30,000 in 2012 and 2013, we received a total of around $45,000 in 2014. WOW!! For those committed to supporting our family, I want to be clear that this is way more than we need to live and serve here in Indonesia. Again, thank you! Request for Funds: Some might be confused and say, "If we are giving you way more than you need, why are you requesting more?" Those who know me at all after 1990 know that we use only a fraction of the funds we receive for personal needs and pour as much as we can into ministry. With our current pattern of receiving inconsistent gifts, it can often be hard to know how much to spend and how much to save for future family needs. We are working on this and hope in the future to better and better anticipate and save enough for family and not spend on ministry beyond our means, so that there will not need to be future appeals for funds. Secondly, Jacky is pregnant with our 3rd child. We heard his/her heartbeat for the first time this past Tuesday. The pregnancy brings a few extra expenses, but most importantly, a desire to get our finances in order to be financially ready for his/her birth. Thirdly, starting 2015, we thought by this time in the year, we would have made 3-5 ministry trips to visit, encourage, endorse, and equip 6th semester students we are closest to who are spending a year scattered throughout Indonesia who were committed to using our material and other means to spread a knowledge of and passion for God's Word. Due to financial restraints and other factors we have not made any of those ministry trips. At this point we are fully committed to only one crucial, long overdue, trip. However, with Jacky pregnant, instead of us going, or myself going without the family, we are sending Tetty and Serniada, two of our most competent, passionate, and trustworthy students to go for us, Lord willing, to 7 locations in 2 weeks in Western Kalimantan. While there is no substitute for the impact of an American coming in to endorse the students in the various villages, there will also be a lot these 2 will be able to do better, more efficiently and quite a bit less expensive than if our family went. We are expecting the whole trip to cost less than $600. 2 Part Ministry: For those new to our ministry, or who forgot due to the long delay since our last newsletter, we have a 2 part ministry. First we are committed to helping Setia, a Bible school in Jakarta with 600+ students, a rich 28 year history, and branch schools, churches, and evangelistic outposts scattered throughout Indonesia. We live right on campus and are involved with helping the students grow spiritually as well as caring for physical needs. I teach English and Bible, tutor in math, and help the school try to establish positive public relations. Secondly, we spread a knowledge of and passion for God's Word among the students and train and equip students who want to spread a knowledge of and passion for the Scripture throughout the country. Recently, we and our students and alumni we have met have already started getting a few Scripture strongholds scattered around the country. How it is: 2 Timothy 4:3-4 For the time will come when men will not put up with sound doctrine. Instead, to suit their own desires, they will gather around them a great number of teachers to say what their itching ears want to hear. They will turn their ears away from the truth and turn aside to myths. We strongly believe Indonesian professing Christians need to know the true Biblical God through His Word. The two huge, currently professing Christian majority, islands of Kalimantan and Paupua are both predicted to be vast majority muslin in 20-30 years as already many entire villages have converted to join the thousands of Muslim immigrants being sent there. The prosperity gospel and much other anti-Biblical foolishness has come from the Western church and is alive and thriving here. Many of the older established churches are steeped in lifeless, unBiblical tradionalism which dominates church life in several Christianized areas, which are often well known to be more immoral and corrupt than their Muslim neighbors. Our Dream and Calling: 2 Timothy 3:15 And how from infancy you have known the holy Scriptures, which are able to make you wise for salvation through faith in Christ Jesus. We hope to inspire, motivate and equip a Biblical church in Indonesia that knows and loves Jesus in line with His Word. Strategically, we are hoping to see Christian schools, public schools in Christian areas, and the many Christian orphanages in Indonesia all encourage and help their students know and love God's Word. Long Term Partners?! : 2 Corinthians 9:6-8 Remember this: Whoever sows sparingly will also reap sparingly, and whoever sows generously will also reap generously. Each man should give what he has decided in his heart to give, not reluctantly or under compulsion, for God loves a cheerful giver. And God is able to make all grace abound to you, so that in all things at all times, having all that you need, you will abound in every good work. We of course rejoice and accept any and all financial, encouragement, and prayer support. At this point, we are also ready to start dreaming of and praying for those of you who believe in our mission and want to support us long term! We believe the need is great, the harvest is plentiful, the potential workers we are training and can train in the future are many, and the eternal fruit will, Lord willing, be vast. Will you join us? Your Part: As already mentioned, any encouragement and prayer you send our way is a blessing. You can contact us by email, Facebook, skype, or visit us in Jakarta. Any and all born again believers (ideally with a passion for Biblical truth) are welcome to minister with us short term or long term. It will be challenging, rewarding, and memorable if you have the time. Those who want to give financially can send a check made out to Phil Walker to my dad, Dale Walker 107 Fox Run Dr. Wilmore, KY 40390. Those who would like a receipt for tax purposes can send to our friends at Scripture Memory Fellowship through their website www.scripturememoryfellowship.org or by check made out to SMF to PO Box 550232 Dallas TX 75355 with a note sharing that the check is for the Walkers in Indonesia. Fundraiser Coming: I hope to send out a fundraiser letter in the regular mail in the next couple of weeks. Lord willing, yearly fundraising letters will be our only direct way of raising funds in the future. If you think I might not have your current regular mail address, please send it to me by return email. When you get the fundraiser newsletter, along with a family picture and an informational brochure about Setia, please let me know by email that we have the correct address and you want to keep receiving these. If you do not want to receive the fundraiser in the mail you can also let me know. Prayer Moves the Arm that Moves the World to Bring Deliverance Down! *Ramadan has begun!—Pray, pray, pray…that the Lord would reveal Himself to the Millions of COUSINS around this world, as they search for Him. *Praise the Lord--We have been given a $2,000 budget from one of our Supporting Churches to make an Indigenous Transformation Film--all the way from script to production. We are working on the story and script in the next few months. Pray for wisdom and the Lord's leading as Andy works with COUSIN Believers. *Summer & MOVE--Summer has started for us, and it involves a MOVE for us to a house that is smaller and walking distance to Faith International Academy. With only three of us now at home, it was time for us to start to "pare down" our stuff that we had collected after over 22 years in the Philippines. *HOB--Please continue to pray for the sustainability of House of Barnabas. We will be adjusting rates and services at HOB as we follow our Lord's leading in helping to make it self-sustaining and continue to serve COUSIN Workers. *Pray for Toks & Fai as they implement DMM (Disciple Making Movements--another word for CPM). Andy hasn't met with them these past three months, but they are still committed to seeing the Kingdom come in their Communities, and are faithfully working and praying for this to happen. *China--Andy has been asked to go to China and do a followup advanced Storying training at the end of September. Please pray for his visa process for this 10 day trip to two different areas there. *Lynette as FIA Academic Administrator--Lynette has accepted the position as Interim Academic Administrator at Faith for this next year. She will still teach Chemistry, but will be taking on more administrative responsibility. She is also Acting OIC over the summer months, since the other administrators are all back in the USA over the next couple months. Pray for wisdom and guidance for Lynette as she takes on this large responsibility. *Praise the Lord--The 2 Open Doors Movie dubbings are done and mastered! *Continued Provision—Please continue to pray for our Lord’s provision for our daily needs (Spiritually, Emotionally, Relationally & Physically) as we serve Him here in the Southern Philippines. He has given us such a great place to serve Him. We’ve been given supportive partners and friends, and most importantly, His Spirit who guides us on a daily basis. We do not take any of this for granted…THANK YOU AGAIN FOR OUR JOURNEY WITH US. Click on the image below to view complete newsletter. Hi. A few years ago, some of my students who are writing Indonesian Scripture songs as a blessing to help Indonesians know and treasure God's Word tried their hand at writing English Scripture songs. As tactfully as I could, I discouraged them. "We already have hundreds of excellent Scripture songs in English much better than these you are writing. Please stay focused on the great need and privilege of writing Indonesian Scripture songs to spread through the country." Recently, however, students who can barely speak English have written 3 simple English Scripture songs I love and that we are using. My wife worked hard to help the students with their pronunciation and joined in the singing so you can understand the words. I assume most, if not all of you are very busy but I wonder if anyone who likes one or more of these songs would consider learning the song and recording yourself or your family or a group of friends, students, etc. singing the songs. Then send the recording to this email or my Facebook or their Facebook pages. We praise God for this new development as it has given the students new excitement about singing English Scripture songs, something that can help them be not only a spiritual, but also a big educational blessing when they return to remote villages throughout Indonesia. Another spark in the students learning English is a new Scripture song writer we discovered who writes simple, catchy Scripture songs in nearby Australia. You can check out his songs atwww.bibleversing.com or his Bibleversing page on Facebook. Setia Update: I have to begin by apologizing for my lack of updates. It has been awkward to go from thinking I was ready to write regular updates about exciting action, to being confused about not much happening and wondering what's going on. In addition, 3 friends asked to see me after my last update and shared damaging errors in my email and advising me with the obvious, "Don't write about a conflict unless you have facts from both sides." The main errors were my writing the "old board" did this and that, when in reality there were 15 people on the old board including friends of Setia and others who were not involved at all with things I was accusing the old board of. Secondly, I had accused the old board of being behind the plan to try to imprison Setia's founder Matius Mangentang. My friends shared that an individual not associated with the old board had instigated the police investigation. I was humbled but thankful. 3 quick updates: 1) a judge ruled in favor of the school against 2 other parties regarding who has the right to oversee the selling of the campus. After months of bad news, bad reports, and challenges thrown at the school, this was a breath of fresh air and the cause of much rejoicing. 2) It looks like the school is finally making headway on a new website. (It is shocking that a school that has been this big for this long still doesn't have a website.) 3) Americans who lived in Indonesia 20 years ago and were instrumental in the rapid growth of the school are starting to take an interest in the school again. I pray that soon this conflict will be over, the website will be in place as a big help, and I can return to my task of letting the world know about God's work at STT SETIA as they "reach the unreached, love the unloved, and serve the unserved." I would like to close with videos of 2 of my favorite people in the world. I hope some of these are helpful to you in your pursuit to know and treasure God's Word. Please pass this information on to others you think would be interested. If you don't want to receive any other emails from me, let me know and I will take you off any future mailings. BOOKS' BROADCASTER GOES.....INTO THE JUNGLE! It was amazing to watch 6th grade boys step into an unknown situation and confidently share the Gospel with younger Filipino kids using wordless book bracelets. This was the highlight of this year’s Outdoor Education. February here at Faith means it’s Outdoor Education (OE) time. This year, I served as a squad leader for twelve 6th grade boys (including Robert). Along with the rest of Faith’s MS, we loaded up and headed to the Subic Bay area for a week of fun, ministry, challenge, and growth. Our squad, the Awesome Peacock Pheasants, spent a day hiking and learning Jungle Education and Survival Training (JEST). It was exciting for us to learn how to use God’s creation to survive while in the jungle. We also spent a day at a beach playing games and learning about sea turtles; each of the boys then had the opportunity to release a newborn, baby turtle into the ocean. Finally, we spent a day at base camp learning communication and teamwork skills through some low ropes course challenges. But the highlight of base camp was when our squad got to visit a local church where over 30 Filipino children awaited our arrival. We sang songs, listened to a Bible lesson, and shared the Gospel using word- less book bracelets. The grade 6 boys did a great job of interacting with these kids and praying with some of them to receive Christ. The missionary kids at Faith are a huge part of our present mission field. With over 500 students, we know that not all of them have a personal relationship with Jesus. Through weekly chapels and experiences like OE, students are not only hearing about Jesus’ love for them, but they are being equipped and challenged to become the next generation of missionaries. • a good visit this past Christmas with my sister visiting from Thailand and Tony’s mom visiting from the States. • for His leading Faith to a possible new School Information System. • healing David and Heather from Chikungunya, a mosquito-borne illness similar to dengue fever. • a great Outdoor Education week and the lives that were changed as a result. • this very busy 3 months prior to our furlough. Pray we will close up this term without undue stress. • some furlough needs: 3-4 bedroom house or apartment, a car for Tony to use, schooling for the boys, and support to discover. • Timmy’s passport to arrive before the projected 5-6 weeks. • a way for Pinky to be self-sustainable. We’re her main support for finances, friendship, etc. We made it to the top! Here’s the gang on our recent 20 mile hike! David is hardly a ‘kid’ anymore as he is 15½ and taller than his mom. We have seen so much growth in his life over this year. Last semester he was chosen as one of the two setters for the JV volleyball team, which he thoroughly enjoyed. He is heavily involved in Boy Scouts and just recently earned his Star rank. Currently, he is the senior patrol leader for the scout troop. Robert is also very involved in Boy Scouts and while he is at the First Class rank, he is hoping to attain Star rank by mid-May. Robert is excelling in school this year with a little bit of organizational help from the learning center. He is really enjoying his band class where he shines in the percussion section. 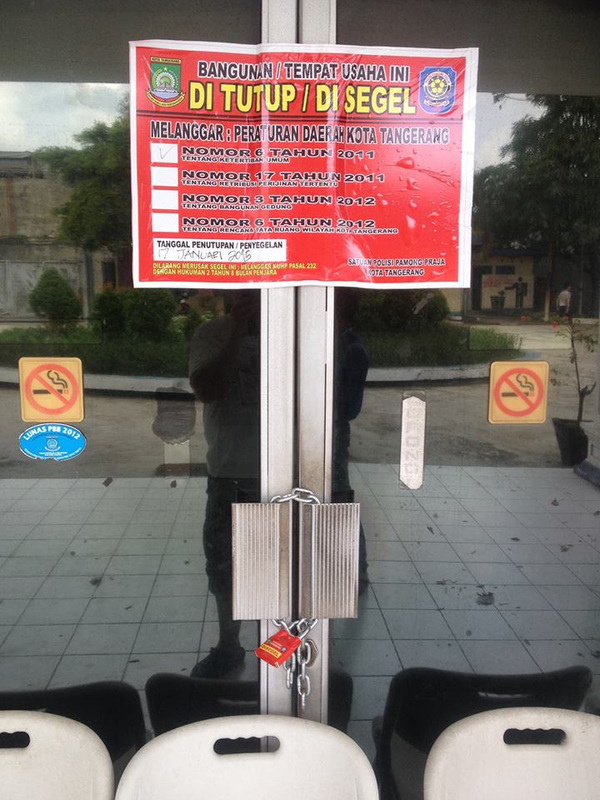 letting the world know the Setia Bible school is closed and sealed. Please forgive my extreme lack of correspondence the last few months. I want to give an update of the serious situation the school Setia where we serve and live is facing. Shortly after moving to our current campus 3 years ago. For those new to Setia (also called Arastamar), the Bible school, located in Jakarta Indonesia has a rich 27 year history of housing, feeding and educating poor young people from around the country before sending them back out to impact and bless villages spread throughout Indonesia with the Gospel of Jesus Christ. Their vision is to "reach the unreached, serve the unserved, and love the unloved". Today there are over 50 branch Setia schools and countless GKSI churches (started by Setia alumni and linked to the central school) scattered on every major island and some smaller islands of Indonesia. Six years ago, Setia was forced by religious extremists from their campus they had been at for almost 20 years. (A short video about the attack and immediate aftermath can be seen at www.memverse.com/stt_setia ) They were somewhat "homeless" for 18 months, with groups of the 1,500 students shuffled from one temporarily location to another to try to keep learning while the school looked for a new home, finally settling on this abandoned factory we are at now which they have been renovating into a campus. For some time, our school has known they would most likely need to leave our large 3 1/2 acre campus. On January 17th, a small group of police, soldiers and local officials came on campus with the plan to lock up all offices, the main chapel (all-school meeting room) and classrooms of our school to stop the school from operating. The school has officially and legally been "closed" by the former school board since April, but has kept operating and even almost doubled their enrollment this year while the school has tried to re-establish their legal standing. to the offices locked and sealed. The visitors came short of their goal, expressing a lack of supplies and only locked up several entrances to the main office building, several other offices and 3 of the 9 entrances to the chapel, while pasting bright red "This campus is closed and sealed" signs all over. I have a few times felt like a "real" missionary doing exciting, authentic ministry as I climbed the 3 make-shift wooden steps to squeeze my large body through the small window (the only unsealed entrance on the ground floor) to the main office building. When I am not in a rush, I usually opt for the safer, more comfortable, and less exciting climbing to the 2nd floor, entering the unsealed door and climbing back down stairs to the ground floor. There were rumors the visitors would come back to finish the job of sealing and locking the chapel, classrooms and offices the following Monday morning but there was a heavy rain all morning to keep them away and we haven't seen them since. On January 17th, the local officials made it clear they would not seal or close the dormitories and that they would give the school 1 1/2 months to evacuate all 700+ students on campus. Our school has opted to continue to appeal for permission to extend our stay. So far the appeals have failed. The school is still hoping for an extension, but is expecting some sort of evacuation action this upcoming Monday. It is unclear what exactly will happen. 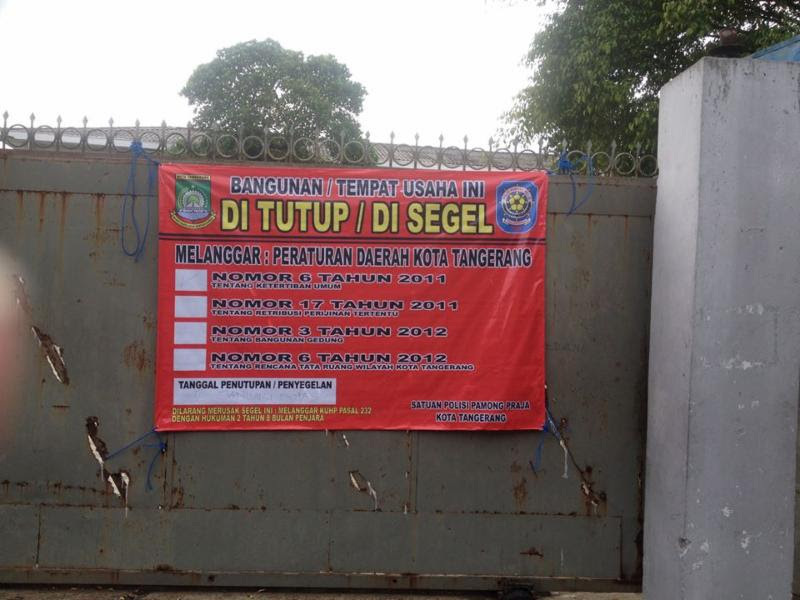 We have been told the old board has made arrangements with 3 other Bible schools in Jakarta and plan on Monday to split up the school with a third of the students going to each of those schools and faculty members also given an opportunity to join the students and finish out their year at the school of their choice. It will be interesting to see what happens. On a more serious note, the old board has initiated a major effort to put the founder and director, Mateus Mangentang, in jail with the charge of recruiting new students to a school that officially did not exist since they officially closed the school knowing full well that the school had no intention of stopping. The old board has the power and has used it to block every attempt of the school to sell the current campus in order to have funds and leverage to buy and start building on new land. The rumor is that they will continue to block the sale until Mateus is imprisoned so that they will get a larger % of the sale and also be able to divert Setia's portion to someone challenging Mateus' leadership of the national Setia movement, further crippling Setia's ability to continue. On a bright note, Setia leadership has allegedly found 2.75 acres of land even nearer to the airport than we already are (making it even easier for family and friends like you from around the world to visit us in the future :) that they are hoping to buy. If they can buy it, or at least convince local officials of their intent of buying it, they might get an extension of time to move there before getting evacuated. Please be in prayer for the school, the students, the national reach of branch campuses and churches and alumni working in the Setia system; for the faculty facing major uncertainty, and for our family and ministry as we seek God's wisdom, strength, provision and guidance for upcoming potential challenges and upheaval. Please also pray for the local officials and others involved that this unbelievably bad testimony of professing Christians fighting ugly with alleged bribing and obvious ungodly attitudes and actions are on display before Muslim mediators and increasingly, in newspapers and on TV in this majority Muslim country. PS Pray that I will do a better job updating friends and family of the crises as well as sending out our regular family newsletter. The Walkers (Phil, Jacky, Phil Jr. and newly walking Maria Sophia) - committed to and loving serving at and with Setia. The Next Generation begins . . .
Our last prayer letter went out on November 22nd, the official due date of our first grandchild, but not her birthday. Instead she was born almost exactly two weeks later. God was very gracious to Rachel with a speedy and safe delivery and a quick return home. Our house is now full of new parents, new aunt and uncles and of course a new grandma and grandpa. Pray for all of us as we adjust to our new roles. Praise God with us as we rejoice in this precious little girl. It is very common to be asked “How do you feel now that you are a grandfather?” I think the typical response would be “OLD”, which is sometimes truly how I feel. However, it really doesn’t feel different at all. There is still the electric shiver when someone calls me grandpa, but there is also the joy of a beautiful new person. As I look at her, I think of the vast potential that is her life. Maybe that is a grandparent thing. As a father, you know that your own children have it, but as a grandparent you understand because you have seen babies become adults, making choices that shape them until they are the full grown people we know today. Someday, Inara will greet us as an adult woman shaped by her choices. There is excitement in the wonder of who she will become, and the spark of hope in the vast potential that God has planted in the form of our baby granddaughter. Pray that Inara will grow to make wise choices, and especially the choice to include God in her life. I think that Christmas this year was a busy time for us with amazing moments of wonder and joy. Some came from time spent with family, or worshipping with friends. Some came at the reminder of God’s incredible sacrifice in the form of the birth of His Son, Jesus. Some came with the presence of another generation in our family in the form of baby Inara. Another year passing, and it is good to see that we are not the same as when we began the year. I am not one to make a lot of resolutions over New Year’s simply because they tend to get broken way too easily. But each year, the prayer for my family is that they will not be the same at the end of the year as they are at the start. Specifically, my prayer is that each would somehow be closer to the person God designed them to become, recognizing in themselves some more of the vast potential which we all have at the beginning of our lives. Kerry is very involved in leadership at the CBS (Community Bible Study) Group that meets every week at our home church, Bayview Glen. She also continues to work part time to supplement the shortfall in our support. Though she would prefer to be home, she enjoys the interaction with others at Once Upon a Child, a children’s store for the resale of gently used toys and clothes. The two high-schoolers have just begun their final exams for this semester. Pray that David Zac and Rianna will finish well. On February 3rd, they will begin their second semester courses and are looking forward to the change. Caleb continues to do well and enjoy grade 4. The school will soon be having try-outs for the Junior (grades 4-6) boys basketball team, and Caleb is already participating in recess practices. Cameron has also begun a new semester at Tyndale College and University. He is enjoying the new Math program that was implemented this year. Pray for God’s leading in his life as he considers how God wants to use the skills and abilities He is shaping at university. Please pray for each of our children as they consider God’s role in their lives. Pray for an open heart and an open mind. My ministry with TeachBeyond picked up pace as we moved into the school year and again in January. There are many teachers in Canada who weren’t able to get the jobs they had hoped to have, and so they begin to look at opportunities overseas. However, for many the idea of depending on financial donations is too challenging. For others, the ideas of moving so far away, living in a different culture, starting all over again, closing down their lives here, or learning new curriculum and expectations can be overwhelming. In a recent conversation with a young lady who is looking to move to Thailand and teach, she commented that it didn’t feel like being a missionary because she would just be doing the same things she is doing now. I responded, “exactly”, as we launched into a discussion of her future role as a missionary and a teacher. We spoke about how every Christian is called to make disciples, and every teacher is called to teach, but not every Christian teacher is called to go. She is willing, and has the opportunity to be the teacher God called her to be in a place He chose for her on the other side of the world. This will challenge her faith, but it will also reveal the person of God to her in a different and exciting way. Continue in Missions Mobilization with the challenge of raising sufficient support. Seek another role in Missions and Education. Seek employment in education either Christian or secular, though employment opportunities are still scarce. Just like the teachers I work with, we are being challenged to see God through eyes of faith. Pray that God would open our eyes to see the path he wants us to follow and that we would be sensitive to His leading, in whatever form it takes. At this point, we feel that God is calling us to remain in Canada and to focus on our family. As we consider the possibility of continuing in this current role, or in another mission role, we face the challenge of raising enough financial support. We continue to rejoice, humbled by how God met all of our financial needs at the end of the fiscal year, September 2014. However, currently there are not enough donations to allow us to meet our monthly financial obligations. Please pray about the additional financial support that we need. We know that there are many praying for us regularly, and we thank you for that ministry.